Well I do! Sissi isn’t your average pair of pumps. It combines beauty of the garden, elegance of embroidery and the delicacy of lace according to the CL lookbook. All that in a pair of pumps? My reaction: Gimme gimme gimme! 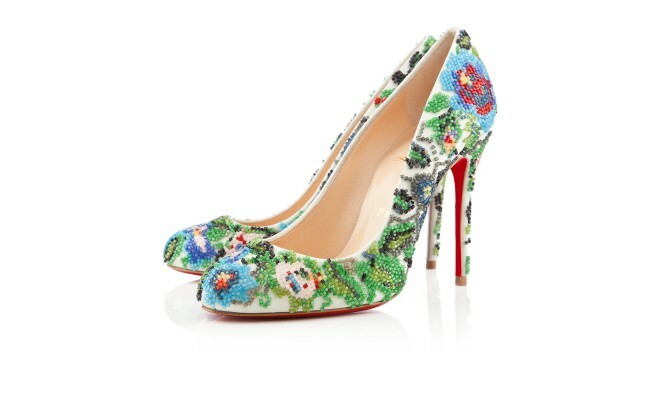 These pumps are from the Spring 2013 collection and feature a round toe, satin finish and beaded embroidery. I’m loving the multi-colored embroidery and I’m afraid the following might sound too obsessive but since I’m putting it all out there, I’m also loving the red soles. Pretending I never said that, lets see who got their hands on these already. Well hello there Blake Lively, no surprise there obviously since she’s probably worn every pair of Christian Louboutins out there. She probably even wears these as bedroom slippers. Well, I wouldn’t mind because each pair is literally a piece of art. About her outfit choice I must say that she should have gone for something that was a little more plain so that the shoes would look a little more eye catching instead of just being blended with prints on her dress. Are you in love with Sissi yet? I know I am. I love this… Would not think twice before spending my hard earn cash on it. This entry was posted on August 8, 2013 by samtotally in Fashion and tagged blake lively, Christian Louboutin, christian louboutins, Embroidered pumps, fashion, footwear, Kerry Washington, must haves, pumps, shoes, Shopping, Spring 2013, style.